The story of this model begins way back in the early days of my chaos collection, although the seeds of inspiration that led to his rebirth are rather more recent. 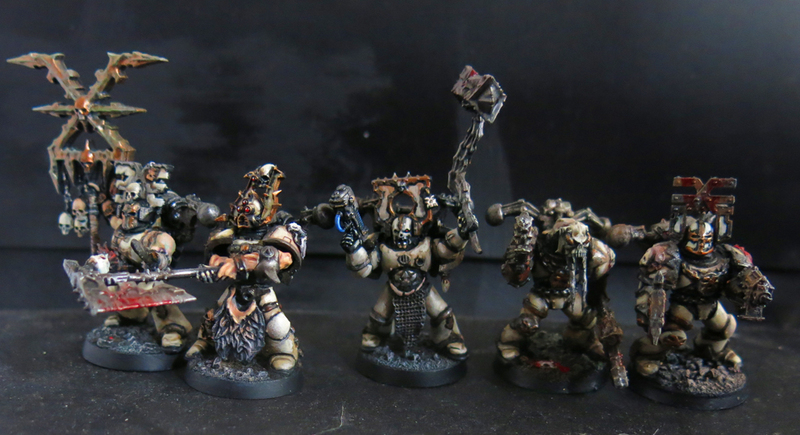 Back in the early autumn I started working on a small group of Khorne Berserkers. I’m still pleased with them, and the feedback I’ve received has been overwhelmingly positive, so it’s time to keep the creative pot boiling by adding a leader to the squad. Here we have the Berserkers as they looked last time we saw them. Enter; this elderly model. I’m not entirely sure when I painted him, I’d estimate 2010 or 2011 at the latest, but whenever it was I was already old and experienced enough to know better. Take a good look at him because this is the last chance we’ll get. Let’s be honest here, he hasn’t aged well. Even when I first built him he probably wasn’t nearly as good as I thought he was and time has not been kind. 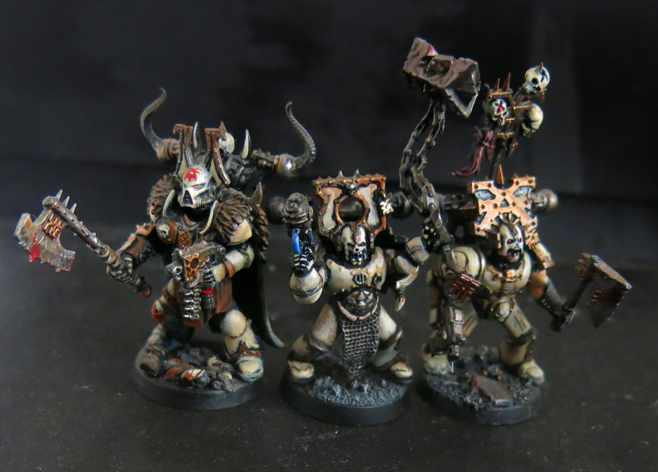 I like to think my painting skills have grown a long way over the years (although I’m still rather taken with that blood spatter – if I may say so myself – especially as it pre-dates the now ubiquitous Blood For The Blood God paint). On the whole though, he’s ugly and painfully short in comparison to the new generation of space marines. Over time he’s been shoved further and further back on the shelf. Some might even say I’m ashamed of him. Despite these flaws I must confess I’m fond of him and that left me with a quandary. On the one hand he really has no place in the collection of models I’m aiming to create, on the other I’d be sad to see him bundled off into a box of old miniatures to gather dust. It would be an inglorious end for such proud old warrior and I for one am not ready to cast him aside just yet. He speaks to an era in my creative development when my ideas were far bigger than my talents and I was only just scratching the surface of what this hobby really offers. That said I’m not going to let nostalgia cloud my judgement. However no servant of the gods need retire when they could just as easily ascend! Not for him the bitter, lonely silence of the bitsbox, not when he can rise again as a warrior reborn, key components snipped away and reused to allow his resurrection. Time for the old brute to get a facelift. Hopefully you’ll agree that he’s a bit more imposing now, whilst still maintaining the spirit of the original. Who knows, this may even inspire me to make some more berserkers. In the meantime, I await your feedback. Millennia ago the warriors of Squad Kadrax followed the Lord of Claws out of the ashes of Skalathrax and away from the ruins of the World Eaters legion. 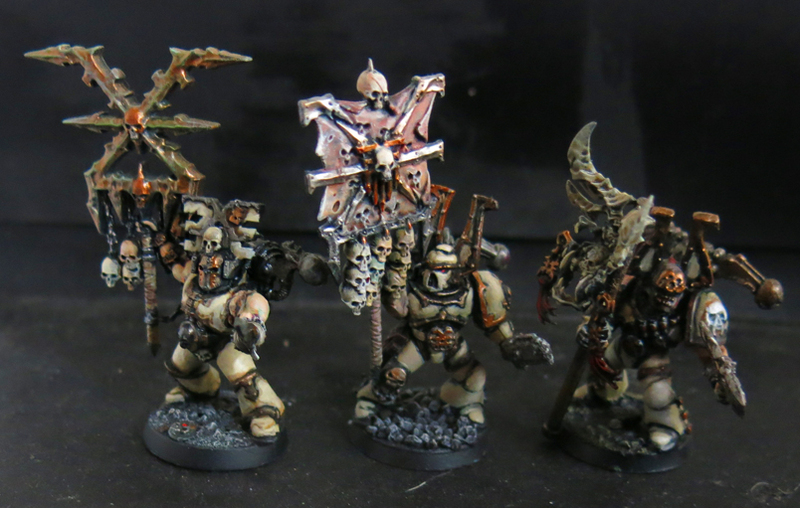 Down the long centuries since they have sought for nothing but to heap skulls at Khorne’s throne. The first Lord of Claws has long since wasted into spawndom, blubber-mad and mewling its blind spite, and the man who claimed his throne is a more subtle master – though no less savage for all that. The Kadraxi care not; like their bloody god they seek only battle. 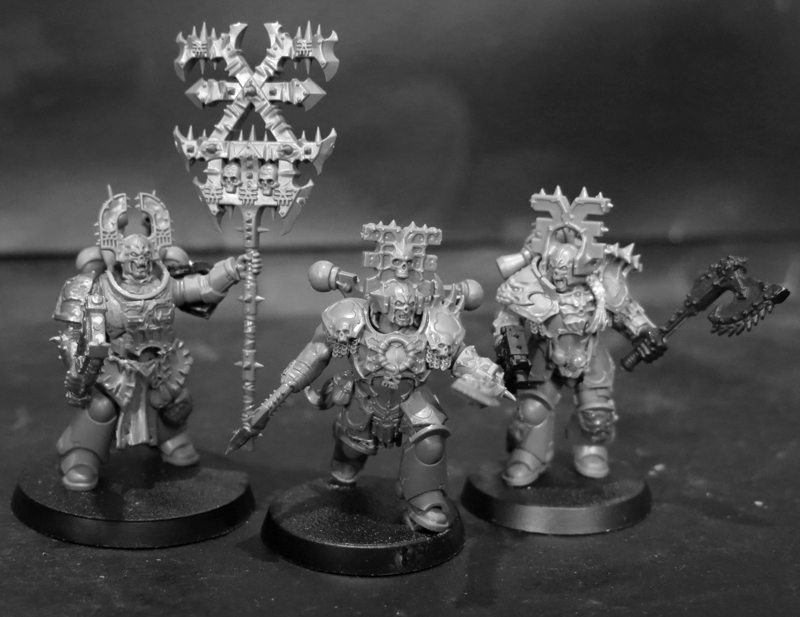 This will be the last Khorne update for a little while. Word on the street is a Black Crusade is coming, and when it arrives I want to be ready for it. Before I am however I want to clear a few other projects from my painting desk, most importantly the unruly mob of Orks who’ve been waiting in the corner for quite some time. Before it’s their turn though there’s still on more addition required to join my berserkers – a champion to lead the third squad. Of course that mace is much too big to wield one handed and just waving it around like a maniac will only end up with him injuring himself – probably before he gets the chance to harm his comrades and certainly before he gets anywhere near the enemy. This time however the rule of cool wins out! Here’s a group shot of Squad Kadrax so far (click it to see a bigger image). In time I’ll be adding three more members to get the numbers up to eight but for now the squad is complete. And here’s the three champions of my berserker squads together. Standing next to his brothers the new boy looks like a right short-arse – mostly because I didn’t want to give him any horns or trophy banners that would stick up and foul that flailing chain. And, because I forgot to do this in the last post, here’s the three icon bearers enjoying their own little group shot. But wait – there’s more. I may be planning to tackle some different projects for now but that doesn’t mean I’m abandoning the Blood God long term. As soon as I saw the huge Khornate sigil carried by the Bloodsecrator in the Age of Sigmar starter set I knew I wanted to use it somewhere in my collection. Trouble is it’s just too big for any normal warrior, even a space marine, to carry. Time to call in an abhuman and build myself a second Ogren berserker. As I’m sure you know by now, comments and feedback are extremely welcome so if you have an opinion you’re burning to share get it in the comment’s box. Until then – Blood for the Blood God and all that! A second Berserker for the newest warband! I’m particularly pleased with the crest on his helmet and the bloodletter skin growing across his shoulderpad (a greenstuffed necessity to cover the join where the sigil of Khorne was added). Before I take on the next batch of berserkers I wanted to give myself a little breather – but without actually deviating from the Khornate theme and wandering off to get lost in the tangled undergrowth of other projects that waits hungrily on the edge of my painting desk. That, I fear, is the way madness lies and so I won’t let anything sway me from my course – not Skaven, or Plague Marines, or those Orks I’ve been meaning to get round to for ages, or indeed anything that does not worship the Blood God with unrelenting fury. However a man cannot paint by power-armour alone and life is at its finest when there are lots of terminators around. Whilst a standard space marine (of either chaotic or loyalist persuasion) takes a little effort to look as good as it should a terminator looks fierce straight out of the box, lording it over its smaller, weaker brothers like the warrior-kings they are (indeed, by giving us access to imposing looking marines for minimal effort painting terminators is in many ways like true-scaling for lazy people!). This blog however doesn’t have ‘convert’ in its name for nothing. Time to start chopping up chaos terminators, khorne berserkers and wrathmongers. I love the huge flails carried by the wrathmongers and they seem like the perfect weapon for a Khornate terminator – a man who combines the speed, skill and raw strength to wield such a weapon with the uncompromising desire to do as much damage as possible without caring about the danger to himself or any allies that stray too close. If I was writing or painting the scene I’d probably have the heads of flails on fire as well to add to the shock and horror inflicted on the poor guardsmen he’s attacking. However as I absolutely hate sculpted fire I decided to avoid that and stick to straightforward blunt trauma. I’m rather pleased with the skull emerging from his armour under the shoulder pad – my little greenstuff reference to the skulls embedded in the flesh of the Age of Sigmar Khorne models. Nor is this angry man alone. His battle-brother is currently standing at the ‘part-painted; looks atrocious’ midway stage of painting but hopefully I’ll get him finished off over the weekend and show him off to you all early next week. In the meantime here’s a ‘pre-primer’ WIP to tide you over. As usual comments and feedback are welcome!